During March 2004 a trial excavation was conducted on Ha-Shiqma St. in Kefar Saba (Permit No. A-4123; map ref. NIG 19454–61/67628–34; OIG 14454–61/17628–34) in the wake of development works and placing of pipes. 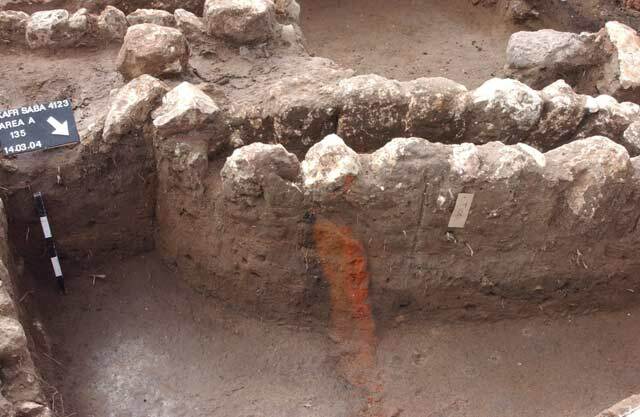 The excavation, on behalf of the Antiquities Authority and financed by the municipality of Kefar Saba, was directed by A. Gorzalczany, with the assistance of S. Ya‘aqov-Jam and A. Bachar (administration), A. Hajian and T. Kornfeld (surveying), T. Sagiv (photography), Y. Nagar (physical anthropology), M. Avissar (pottery consultation), L. Yachiye (GPS), Y. Gorin-Rosen (glass and beads), Y. Kupershmidt (metal conservation), M. Suiskaya (pottery drawing), R. Vinitzky and O. Shamir (textiles), A. Berman (numismatics), C. Amit (photography of small finds) and N. Zak (drafting). Further assistance was extended by G. Birman, G. Parnos, K. Sari and M. Masarwa. Kefar Saba is located in the southern Sharon region, which is divided into longitudinal strips between parallel kurkar ridges. Thin sandy soils (Hamra) with pockets of alluvial soil were created in the valleys between the kurkar ridges. Many archaeological excavations were undertaken in Kefar Saba and its environs (see HA–ESI 113; ‘Atiqot 34). Prior to the excavation preliminary inspections were conducted in the area by G. Hillel and A. Azav. The excavation area was on the southern margins of ancient Kefar Saba, extending over a low hill. Earlier development works caused damage to the area. Six squares aligned east–west were opened along the planned route for laying the pipes. 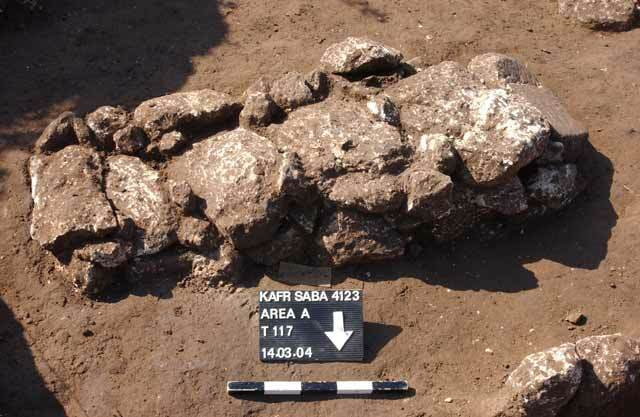 Two strata were exposed: The lower (II) contained remains of a kiln and a soil fill mixed with potsherds, dating to the nineth–eleventh centuries CE; a cemetery from the Ottoman period was in the upper stratum (I; Fig. 1). Removal of the surface layer by mechanical means revealed 24 pit graves of individual burials, generally oriented east–west, which were part of an early cemetery. The graves used a single method of construction. The interred was placed in a shallow pit dug in the dark silt and was encircled with a single row of lime stones, either roughly dressed or simple fieldstones, which marked the grave and was on a higher level than the corpse. Sometimes, particularly in cases of adults, the tomb (up to 2 m long) was covered with flat stone slabs of uniform ample size that were laid on top of the peripheral stones (Figs. 2, 3). The deceased included men and women and a relatively large number of children, whose graves were smaller. In graves where articulated skeletons were placed, their position was fixed: the corpse was on its right side, the head toward the west, the feet toward the east and the face always looking south (Fig. 4). 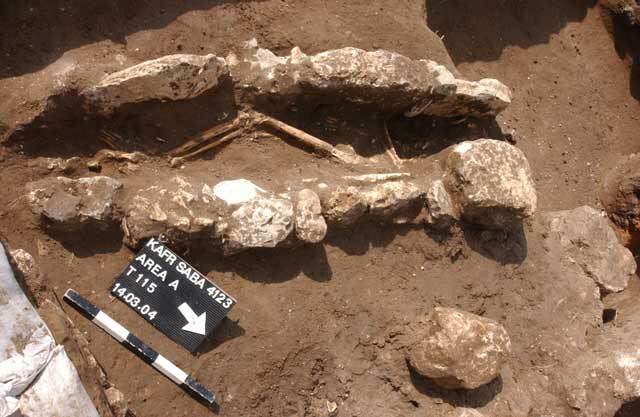 A similar burial position was discovered in several cemeteries of the Islamic period, e.g., at Sarfand el-Kharab in Nes Ziyyona (‘Atiqot 46). Small finds were uncovered only in women's graves, including jewelry that consisted of bronze and glass bracelets, necklaces of glass and stone beads, and necklaces of coins used as beads that were placed around the chest of the deceased, or around the head. Two graves contained beads made of linen fiber that perhaps were part of the clothing decoration. In addition, a bronze make-up stick and glass finds were recovered. A burial of an articulated adult woman included a square glass tablet that was apparently used as a mirror. Two bronze bracelets were on her left forearm and a glass bracelet, of a type known since the Mamluk period, on her left arm. A particularly outstanding grave was that of a young woman, aged 18–25, who wore much jewelry: two bronze bracelets on her left forearm and numerous beads. Next to Tomb T108 (Fig. 1) was an intact grenade-type vessel, whose dating range was from the beginning of the Islamic period until the Crusader period and its distribution was throughout the ancient Near East. Scholars believe the vessel contained mercury, perfume or oils; others think it served a military purpose. A kiln that had been cut by a tomb (Fig. 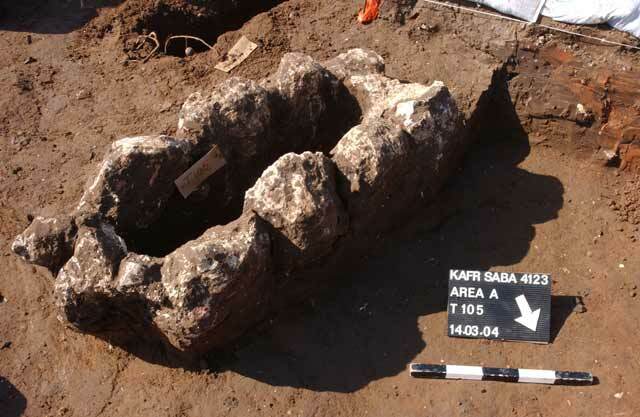 5) was observed in the western area of the excavation. The soil fill that abutted the kiln contained a large quantity of potsherds, including jars, large bowls, jugs with double and triple handles, fragments with plastic decoration and glazed bowls. The homogeneous assemblage was dated to the nineth to eleventh centuries CE, which was also the date of the kiln. The dating of the graves that cut into Stratum II is more difficult. The finds in several graves (textiles in excellent condition) show that the cemetery was late and probably connected with the village that existed at the site before the founding of the state. Nevertheless, later graves appear on surface in close proximity to the excavation, c. 1.5–2.0 m above the graves exposed in the present excavation. It therefore seems that the excavation was of an earlier stratum of the Ottoman cemetery. The identification of the coins retrieved from several graves will enable a more precise dating of the cemetery. The excavation exposed a kiln and a cemetery on the southern margins of an agricultural village. The area was active at least from the nineth century CE until our times. Random finds (many mosaic tesserae scattered over the area and Gaza jar fragments) indicate that the activity in the area had probably begun in the late Byzantine period. It appears that the area ceased to function as an industrial ground in the Ottoman period and changed over to a cemetery. 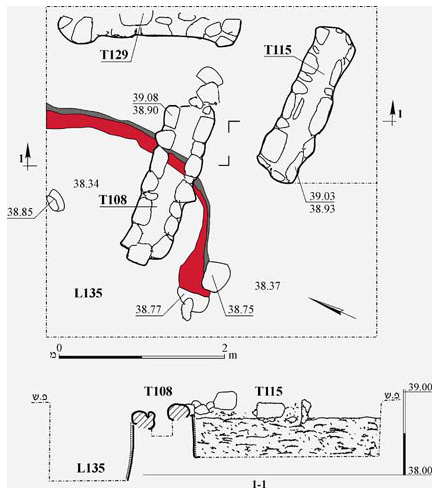 This conclusion accords with the findings in the excavation carried out by G. Birman (HA–ESI 118), a few tens of meters north of our excavation. The finds, in situ, within the graves that contained articulated burials (textiles, metals, beads and glass) and the large number of excavated graves enable a statistical and demographic research that will contribute to the understanding of the period. 1. Plan and sections of a typical grave. 2. Pit grave without covering slabs. 3. Pit grave with covering slabs. 5. Grave T108, cutting Kiln L135, looking south.